Hoffa’s concessions not welcome as negotiations between UPS and Teamsters 705 continue | Fight Back! Chicago, IL - Negotiations continued between Teamsters Local 705 and UPS, October 25 and 26, on a collective bargaining agreement covering nearly 10,000 Chicago-area workers and one of the last two to settle with UPS around the country. Capturing the attention of Teamsters everywhere, Local 705 Secretary Treasurer Juan Campos stated he would not accept many of the concessionary deals negotiated by Jimmy Hoffa and Dennis Taylor under the National Master UPS Agreement - an agreement recently ‘ratified’ against the members’ will - which covers every UPS Teamster except those in Locals 705 and 710. Campos also stated a 30-day notice may be given to UPS to end the contract extension, ongoing since August 1, should UPS continue to drag their heels, raising the possibility of a strike. “We thoroughly discussed the proposals and what's important to the membership. 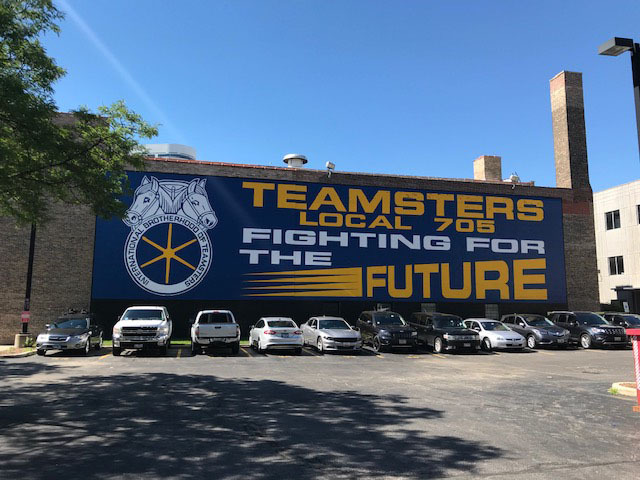 We are united and fighting for the best contract possible,” commented Local 705 package car steward and bargaining committee member Raul Medina. The negotiations included an exchange of proposals, both for contract language and an economic proposal by UPS that largely mirrored the national master agreement. The bargaining committee is looking to increase the pension, lower retiree healthcare, raise the wages of existing and future part-timers, make the workplace safer, and protect package car and feeder jobs, among other issues. Tentative Agreements were passed around some language issues while UPS left negotiations saying they heard the demands and agreed to come back to negotiations October 30 and 31. With the holiday season fast approaching around this major transportation hub, workers everywhere looking for a victory should pay close attention.